Would the Russian direct tax model work in India? Russia has a flat rate of 13 percent income tax for individuals and 20 percent tax rate on corporate profits and a relatively uncomplicated and transparent process for tax declarations. 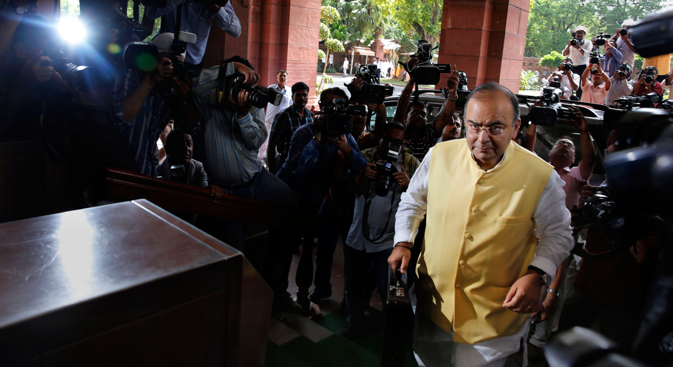 Ever since Narendra Modi became India’s prime minister, there were several rumours about how the tax system in the country would be completely overhauled. People with “connections” in Delhi said the rates would be cut in each bracket and the exemption limit would go up to Rs 5 lakhs from Rs 2 lakhs. The wildest rumours even said that income tax would be waived for people making less than Rs 50 lakhs. The final announcement was made this afternoon by India’s finance minister Arun Jaitley, who raised the income tax exemption limit by Rs 50,000 (Rs 1 lakh for senior citizens) and limits under section 80 C by another Rs 50,000. Middle class Indians won’t exactly be bursting firecrackers, given the level of expectations, but these are positive developments. One of the biggest complaints that one hears in India about the whole concept of paying taxes is that the tax-payer gets very little in return for his income tax contributions. When I argue that public transport, including all the new metro systems in Indian cities, university education and even municipal services are subsidised by the tax payer, the common response is that none of these are world class by any means and that we’re paying too much. It is also argued that a smaller rate of tax for individuals would motivate more people to voluntarily declare income and file returns. In Russia, there is a flat income tax rate of 13 percent for individuals. When salaries are quoted by companies in Moscow, it’s almost always the net amount. Since it’s the responsibility of the employer to file the necessary tax papers with the government, employees of organisations are more or less disconnected from the whole tax process. The average Russian does not spend a great amount of time in the whole process of investment planning linked to tax exemptions, the way the middle class Indian does. There is also a virtual absence of paperwork for those who don’t have any additional income besides what they get from their regular jobs. Of course, those with multiple sources have to file a tax declaration, but then the paperwork is much less than in India. Russia also has a social tax of 30 percent that goes into paying pensions and providing healthcare, but this is paid by the employer and not an individual unless he or she is self-employed. The capital gains tax in Russia is also 13 percent, but profits from the sale of real estate held for more than three years by an individual are completely exempt from taxes. If India introduced the Russian model of 13 percent income tax for individuals, this would inevitably lead to increased tax collection in the country. This would of course have to be followed up with a system where exemptions are phased out. A process where employers file the return for employees and where individuals make an uncomplicated declaration for their additional sources of income would make the system more transparent and at the same time remove mountains of paperwork. India is a young country with enormous potential and if the new government can bring about reforms, the Indian demographic dividend can be completely taken advantage of. Reforms would lead to greater productivity in the country and higher economic growth and the need to employ a large number of people. A low tax rate would be completely complementary with a high economic growth and a growing workforce. In fact, overall lower tax rates for companies on the lines of Russia, which charges a corporate profit tax of just 20 percent, would bring more multinational companies to India. The country would actually be seen as a tax haven, if it reduces its taxes further and makes rates on par with Singapore, which has a corporate tax rate of 17 percent. Given the fact that the India’s labour and overall costs are low and big parts of the country do not suffer from extreme climate, a lower and more transparent tax structure could bring some of the best minds in the world, along with some of the largest multinationals. This would only mean more jobs for Indians and prospects for great growth. One could argue that Russia has a large number of tax cheats, both corporate and individuals, who park their money in offshore accounts in places like Cyprus, but then no system in the world is fool-proof. However, simplified tax procedures and lower rates only encourage more people to become honest. The Scandinavian high-tax model would just not work in places like Russia and India. Sweden and Denmark, with their tiny populations and limited problems would fit into tiny corners of larger countries, which have greater numbers and far more complicated problems to deal with.